You may or may not remember my original post on my dressers, but recently I made some changes that I thought I would share. Not much has changed in this area. 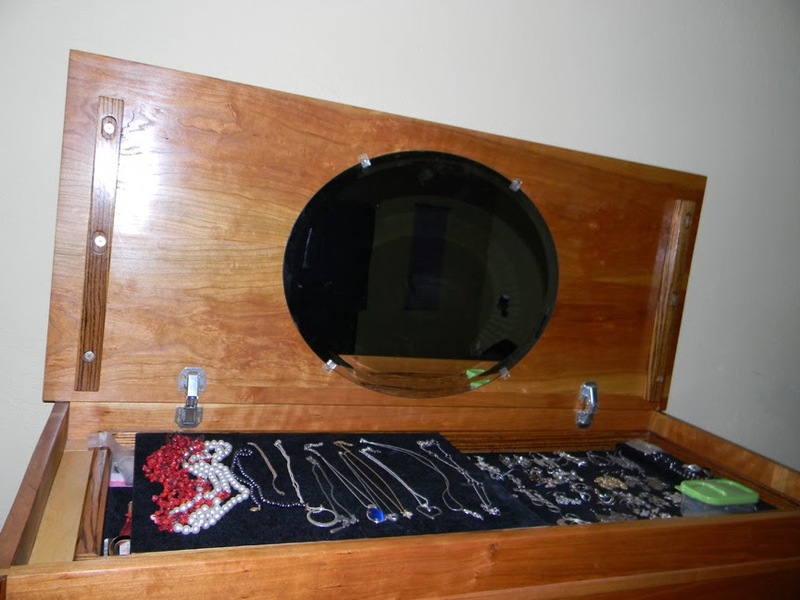 This is my hidden jewelry box that is in the top of the dresser. Notice in the other pictures you can't tell that the top lifts up? Yeah, that is my invention. Cool, huh? 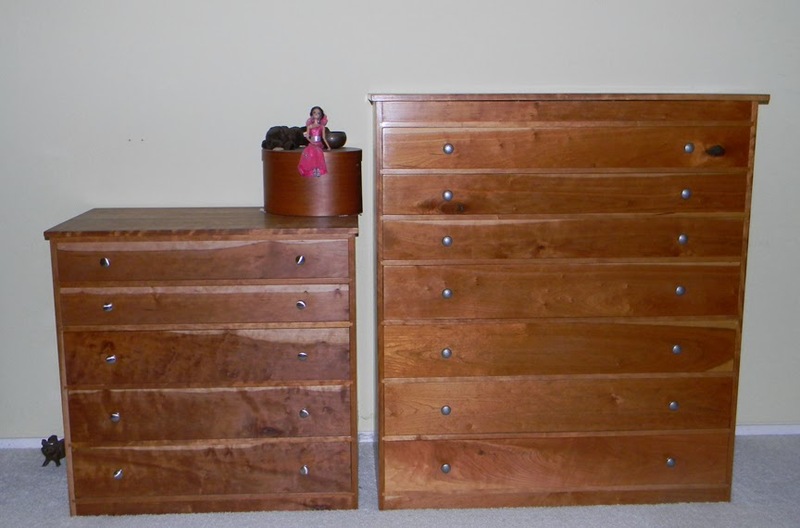 Oh yeah, if you don't know, I built these dressers. It is part of a cherry wood bedroom furniture set that I am constructing over time. I have 3 dressers done and two nightstands. I need to do the bed and a blanket chest still. First change. No more segregating my clothes. It used to be that my female clothes were in one location and my male clothes were in another. Now I have put all my clothes together. 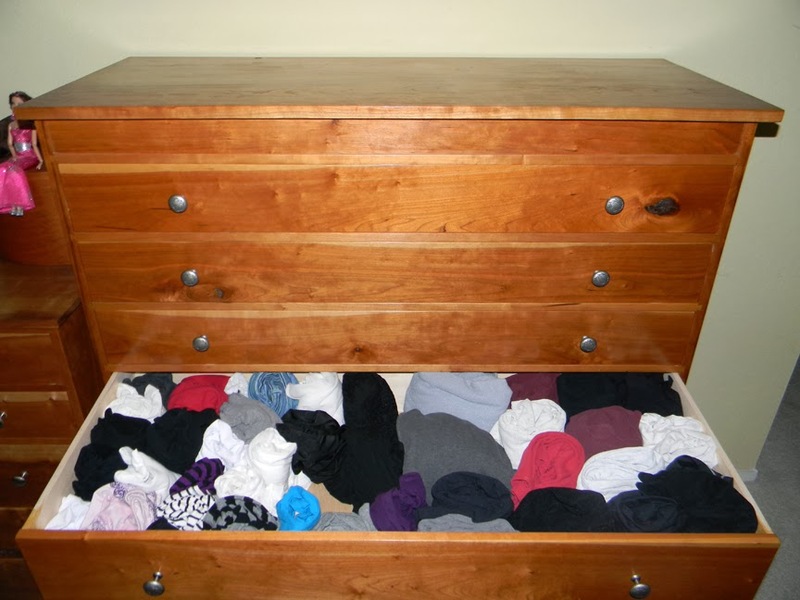 If they are sweaters, they are all in the same drawer. Same thing with shorts, shirts, etc. Maybe in the picture above, as opposed to the one on the right, you can better see my inspiration Barbie. She sits on top of a hat box on my little dresser and watches over me. I suppose she is my fairy Barbie mother. Okay in this picture you can see the other big change from the last time I showed you my dresser. I saw a pin about rolling your clothes, so I tried it. Wow, it works great! 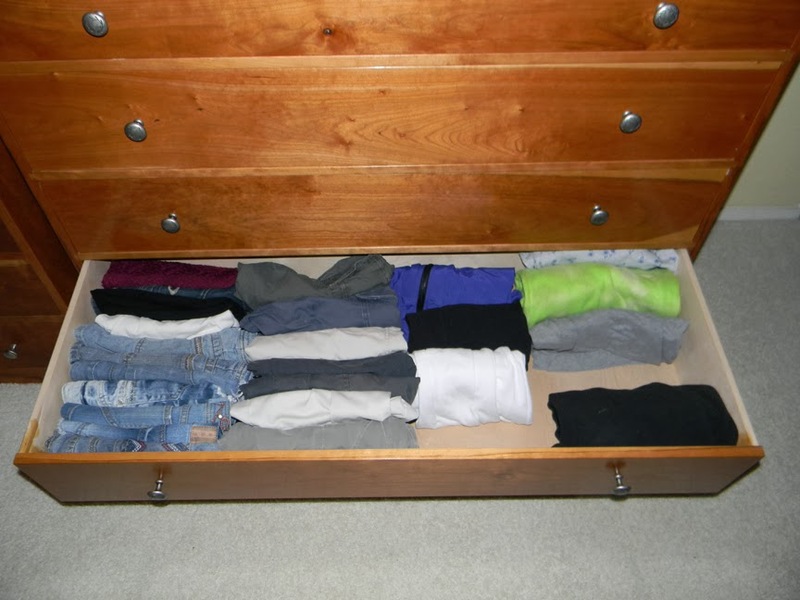 There is so much more room in my drawers than before. I was actually able to remove a bunch of stuff from my very cramped closet and get it to all fit in this drawer. 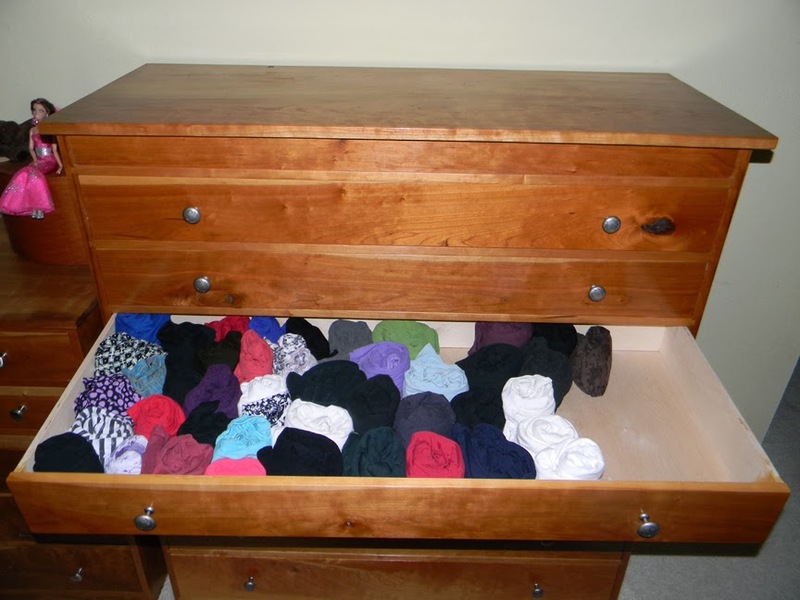 This is my sweater drawer. Can you tell which ones are my male sweaters? They tend to be the darker colored ones. The sweaters I did not roll up, they are set on their sides. 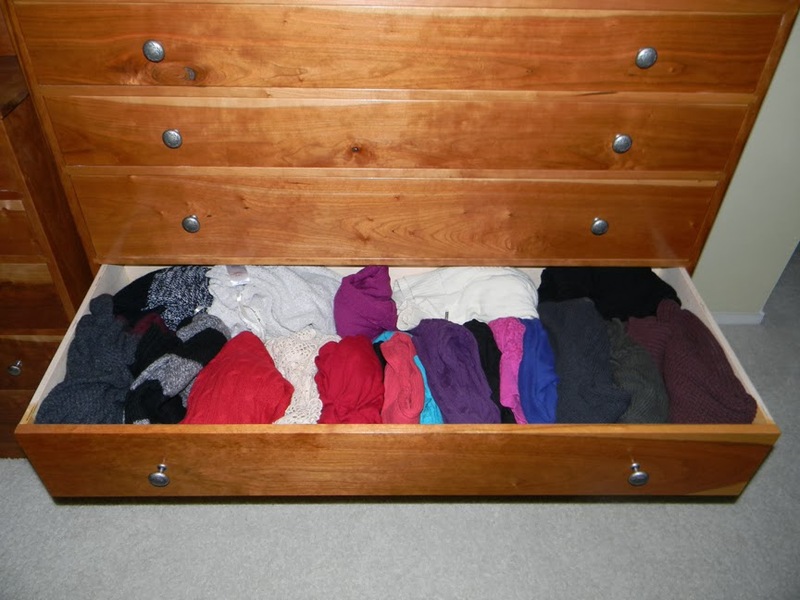 Again, this was a huge space saver as well as allowing me to see all of my sweaters upon opening the drawer. This drawer used to be impossible to deal with. It contains all of my shorts and sweat pants. The shorts did not get rolled, they are just placed on their sides. The larger items, like sweats and such did get rolled and then placed on their sides. I saved so much room in this drawer, and again I can actually see everything in it. I love this drawer especially. The bottom drawer. This drawer contains all of my fancy work pants and all of my yard work pants. Two things about this that I think are funny. One - my work pants are now rolled and stuffed into a drawer, being as I rarely if ever wear them anymore. yeah I kind of gave up on the fancy pants for work. 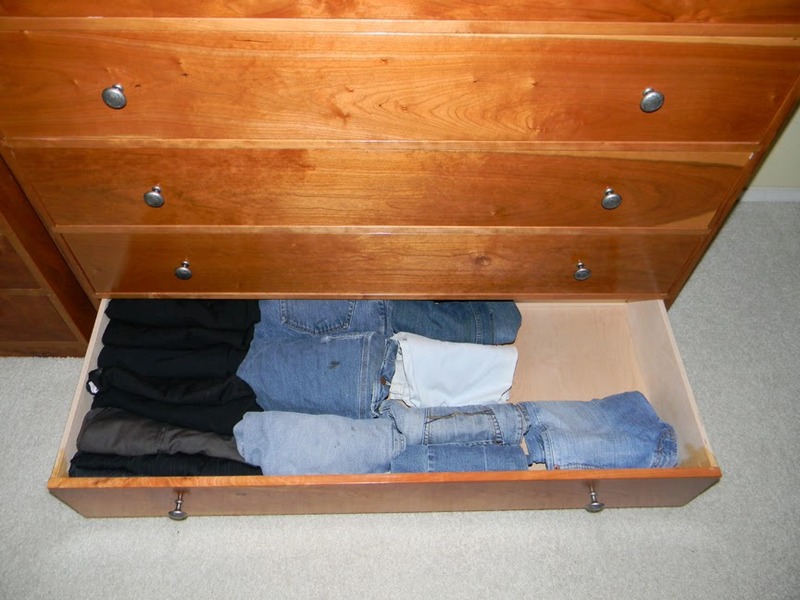 The second thing I find funny about this drawer is that in my yard work jeans section there are female jeans in there now. I have finally owned some girl jeans long enough that they have made their way in my yard work jean section. How funny. 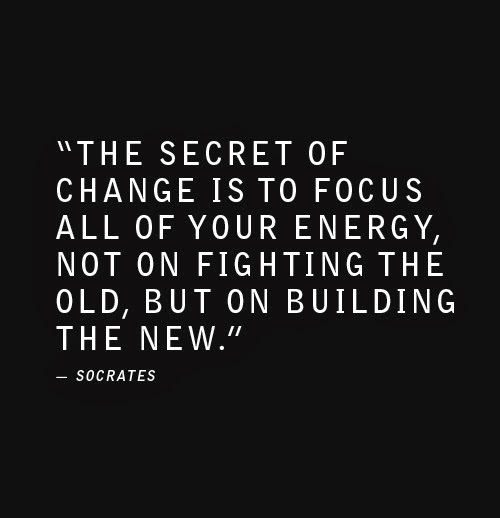 Just a little quotey-poo for your Monday. Learn to love yourself, because you live a life that deserves it. Love life, because you live a life that deserves it. Thanks Betty. To be organized you need to decide on a system and then implement it and stick to it! Good luck!